Mostly known for her work in the arts, as a scribe and garber, and in service to the game as an adminstrator for many of the game's online resources. Linden continues to support members of her prolific beltline and her friends in the game, but is much less active than she once was. She now participates actively in the SCA. In 1996 Linden fell into Amtgard when her battletech group, the CHD, became so large that they could no longer play together. The group was composed of high school students from Round Rock, Texas. After talking a bit the kids began looking for an alternative game. The GM of the group, Breetai had once played Amtgard at a park called Drakenroc, so the dragoons decided to give the park a chance and went out to it's old location one weekend with their sock covered PVC weapons spoiling for a fight. But the park wasn't there any more, having folded due to lack of attendance. And so the third iteration of the park known as 'Drakenroc' was born. 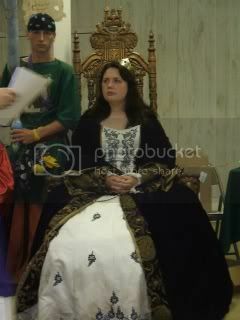 In 1999, after several years in the CK Linden returned to her home state of Louisiana and played briefly at the Duchy of Crimson Moon under the Wetlands. 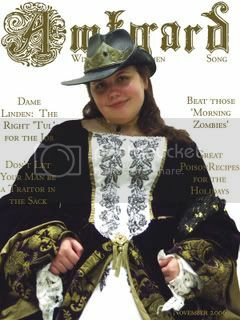 Spending barely a year abroad, Linden returned to Texas and joined the Duchy of Tori-Mar where she played until it was disbanded briefly in May of 2007. Her last regular park was Nocturnis in Cedar Park, Tx. Now a days she is mostly found on the internet, or at very random events. Linden’s first love was fighting, but over time she found that in order to have people to fight; the game has to function properly. So in 1997 she began holding local office. Over the next few years Linden spent most of her time in some position or another eventuall she had held every in game office from the park level up. This being a convenient and still challenging way to be involved while she was assembling her brood of three children; Quinn, Nicoli and Genevieve. Later on she would add two more, twins Ethan and Eleanor. She was the 24th Champion, the 26th, 28th, and 29th Guildmaster of Reeves; the 27th Regent, the 30th Prime Minister, and the 33rd Monarch and the 34th GMoK of the Celestial Kingdom. She is one of two women in Amtgard to have accomplished this feat ever, and the first person ever to hold all four, or five in the CK. Linden has been awarded many titles over her tenure including that of Defender for her stint as the first female Champion of the CK. She also acted as a regular autocrat, running several kingdom events, demos, and classes. With her Co-Autocrat Chango she ran Spring War 2006: Yooks Vs the Zooks, based on a popular Dr. Suess book on the escalation of warfare. The event drew more that 500 people, and put the CK back in the black, and reconfirmed Spring War's status as the largest Amtgard event at the time. During her reign as Queen of the Celestial Kingdom, Linden went to war with the Wetlands in the person of the zombie king Slyddur. Raids were held back and forth, at Murky Waters and Mordengarrd culminating in a battle at the following Spring War. In the later part of her career she spent her time up keeping the old ORK, and wiki, as their administrator. She also spent a lot of time welcoming new chapters to the game, and coordinating the yearly amtgard audit. Later most of these duties were handed down to her Grand squire Tye Dye. 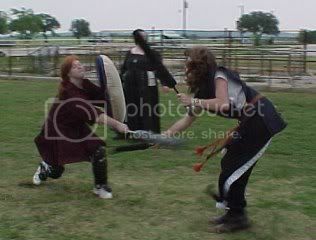 Together, they were invited to present a keynote address on their report at the Living Games conference, which is an academic conference for larping. You can hear their talk, . She also enjoys making garb and award documents for players across the country. As a personal challenge she sought commissions from each of the Kingdoms, and in 2012 after making more than 70 individual awards she successfully made an award for each of them. Linden continues to make scrolls for friends and as well as commissions for players all over the country in amtgard, SCA, and for mundane clients. She has also been honored to produce a Kingdom charter for Desert Winds, Tal Dagore, Northern Lights, Westmarch, Rivermoor, and North Reach upon their achievement of Kingdom status. Henchman No. 42 of the I.L.B.F. With agreement from both Dame Linden and Squire Kite, Kupe is with our appreciation, fostering Kite. Linden was proud to be knight to Alona Twotrees until she was inducted into the order of the Flame at Neverwinter Coronation and Olympiad in January of 2012. She was also proud to be liege to Roslyn who became a knight of the Serpent in 2015. Her Grandsquire, TyeDye also joined the peerage in 2015, in the order of the Flame. Tyedye died unexpectedly in 2016 and is keenly missed. Knighted in the Order of the Flame in August 2005 at Mid-reign of the CK by the Monarch Ween. Knighted in the Order of the Crown in May of 2007, by their Majesties Queen Dame Mistress Wynd and King Sir Father Thomas of the Celestial Kingdom. Knighted in the Order of the Serpent in August of 2010, by Thierry Majesties Abi Cross and Sponge of the Celestial Kingdom. Linden is also Grix's favorite. 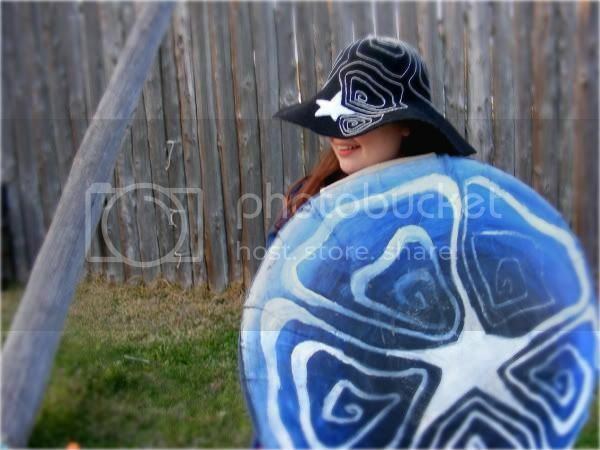 Seen here with her hat, at Triple Kingdom Midreign 2008. This page was last modified on 12 September 2018, at 12:16. This page has been accessed 91,327 times.